Grooming - showing love and affection among bonded bunnies. if alpha bunny needs to reaffirm the pecking order. Fortunately, we had lots of pictures from which to choose for this activity. Here's a (too long) video showing how lucky Bunya is - the girls take turns grooming him. A real groom-fest. This is to be distinguished from when a human wants to groom them, for which they express a different sentiment, succinctly demonstrated here by Bunya. Of course, grooming is most evident if you have a pair of bonded bunnies. (Otherwise, you have to rub their little heads for them.) If you have a single bunny, think about having your local HRS chapter or other rabbit rescue arrange some dates for your bunny. Remember: You don't pick their mate - they do (make sure everyone has already been "fixed" and has healed). 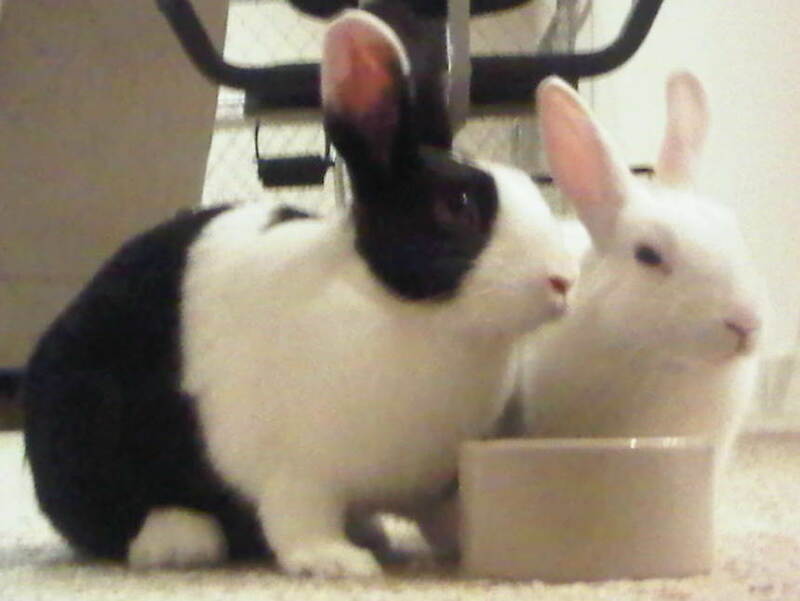 If you are thinking about adopting a rescue bunny, forget the dating process and just adopt a bonded pair - that's the easiest. 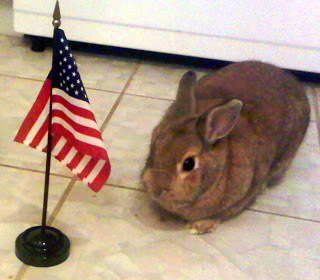 As noted in earlier post: This week, RR will try to explore the Activities of Daily Living for bunnies. Won't hit them all in a single week, but we'll see what we can do. #4 - Stay alert - always! Staying alert is deeply bred into a bunny's DNA. any other indication of an intruder, a potential threat. to the other buns with a loud THUMP! 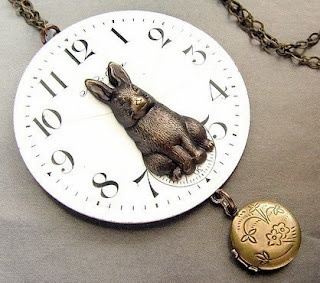 Some sound, smell or movement alerts the bunny. Lucy: That human is thinking about picking me up. The bunny may "periscope" to better assess the threat. Lucy: This is the only place they have never been able to reach me. While many readers commented that their bunnies also love hay cubes (yesterday's post), this one is applicable to anyone who has a bunny, because they love to do this. 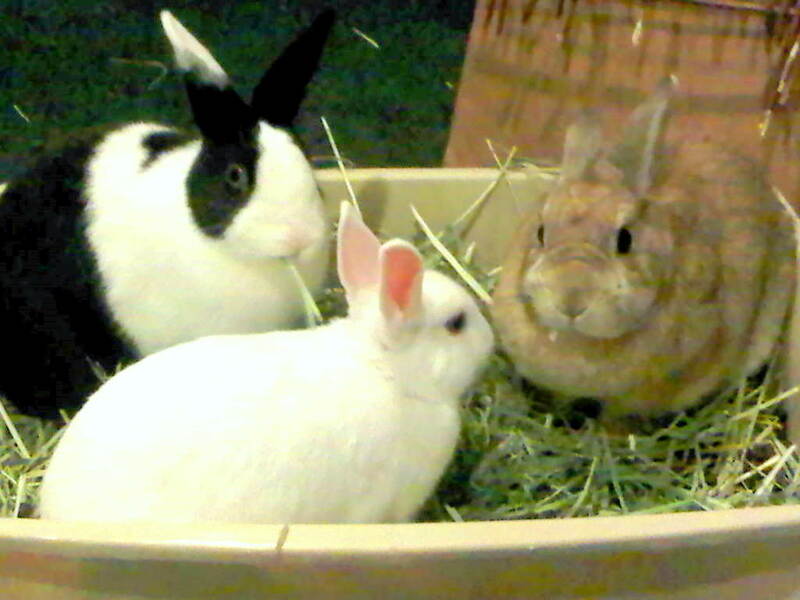 One of the many nice things about bunnies is that they can be litter box trained. If they are "fixed", then this is easier. It's also easier when they are a little older. Once Lucy & Ethel approached a year, the number of free-range poops (i.e., not in litter box) decreased substantially. Bunny poop is very important for gauging the health of your bunny. Healthy poops are round pellets. Not-so-healthy poops may be smaller than usual, runny or strung together (someone's been eating carpet fibers). No poops might be the worst. Read up on poop in the resources; it can indicate some serious medical conditions that need to be addressed quickly. Georgia HRS - look under the heading RABBIT POOP & DIGESTION for relevant articles. HRS has a page of medical topics here. Wishing you all a lifetime of healthy, round poops. Well, wishing that for your bunnies. This activity may be done solo, in pairs, or all together. this was a group activity. This week, RR will try to explore the Activities of Daily Living for bunnies. Won't hit them all in a single week, but we'll see what we can do. Sharing a plate of greens. 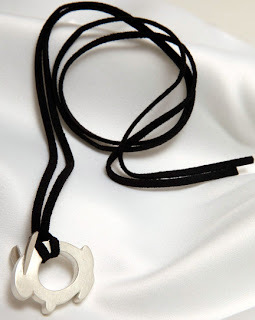 - one of this trio's absolute favorites! Look at this adorable squee-worthy couple! Um, er, ah ... or Bruno and Coco. Saved from a very questionable fate. Their human is obviously very in love with them, has learned all about bunnies and has set up their own room for them to live in together. Actually, Ethel was on the sofa first and I guess one of them didn't want to share. So this begins with what looks like Lucy shooing Ethel off the sofa. Then Lucy starts sofa diving. Not sure what was so fascinating. She starts off digging on the pillow she won as the March 2011 Cover-Bun at Bunny-Whipped.com. Maybe she's looking for Black Friday shopping deals - which in her case would be any treats dropped into the cracks between the pillows! Family hosting a wonderful Thanksgiving feast (and inviting us and our extended, expanded family ... much like our waistlines later today). And you -- Rabbit Ramblings readers, members and commenters. but Ethel is the first to go in for the "chin". Bunya is the first to venture inside. Lucy peeks over the back wall to scope it out. Bunya tried to demonstrate it was big enough for two. Lucy was having none of that and hopped out over the back wall. If you build it ... they will nom. Sometimes, the bunny momma picks up some wheat grass for the bunnies' dining pleasure. It's like a little piece of lawn comes inside just for them. The bunnies excitedly gather round their dinner plate. Lucy taking a breath between bites. A very short, quick breath. We usually let them munch for a couple of minutes and then remove it to regrow. And one day, we forgot ... it got a bunny buzz cut. so there's hope for more lawn treat next time. Bunny momma's been surfing the internet. Again. 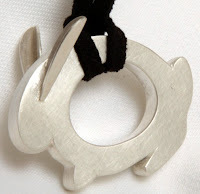 And so RR can bring you some more bunny jewelry finds, for your holiday shopping consideration. What are you waiting for? Get out there and re-start the economy! 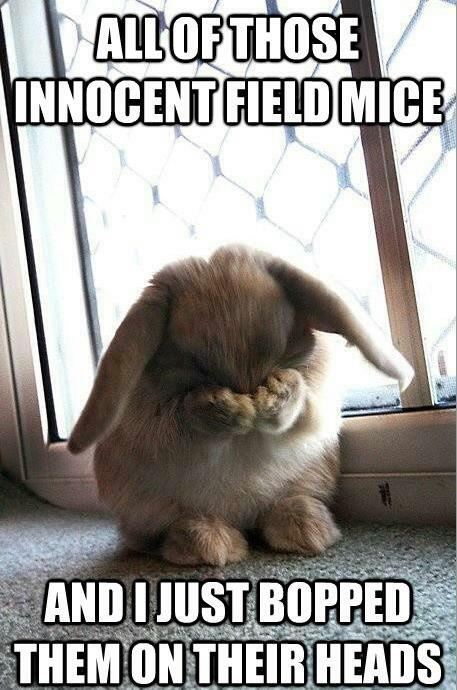 Before getting to the fundraising, I must start off with bunny cuteness. Here is one of this chapter's adoptables. 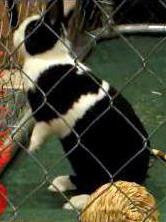 One of four bunnies rescued together. You and your bunnies can snuggle up and stay warm this winter with this quilt from the St. Louis HRS. This beautiful bunny quilt, "Wish Upon a Star"
You can see more views of it and bid on it here. Actually, you may want to hang it somewhere. It is a work of art and, I'm sure, a labor of love. 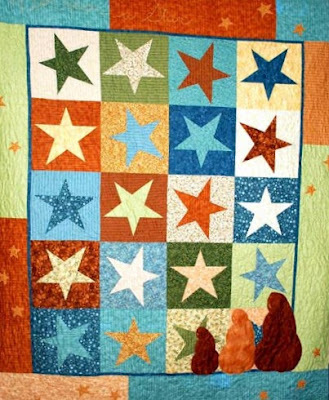 You do not have to live in St. Louis to bid on the quilt. If you are in the U.S., you can bid. P.S. You can see all their adoptables here. Hmmm, to clarify: Not shopping for bunny, but bunny stuff for humans. And it will, of course, make an appearance on the Bunny Things page. By the way, if you really would like a bunny themed gift for someone, check out the Bunny Things page. You may get some ideas and many of the items pictured have links to the store or artist. Not boxes to pack bunnies in, but packing boxes for bunny playtime. Step 1 is always the same - peel off any tape, labels and staples. Step 2 is to make some doors. More than one helps them feel like they can escape danger. Usually, they get at least one per side. that they like to chin and chew on the doors, too. You could stop here and the buns would have fun with this. including this huge one, we kept going. The brown box in the first picture is inside this even bigger box. The white box is over twice the height of the brown box. and different places to hide inside. holding it in place inside the bigger white box. Lucy: Hey, there's an echo in here! Bunya's peering down into the "box canyon". of the new box(es). She is too fast for a focused picture. no flash to disturb them and the colors are more natural. But she's happy to share with Bunya. How do you keep your bunny entertained? Please share in the comments any ideas for enhancing one's bunny playground. Rabbit Ramblings has a Facebook page! this next move into social media. A few months of prior posts have been listed to seed the page. Links to new RR posts will be added to the Facebook page as they are written. 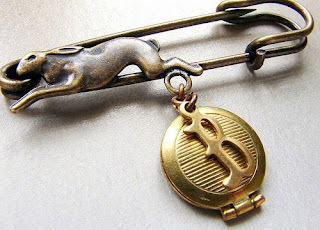 This is just another way for RRRR (Regular Rabbit Ramblings Readers) to keep up when a new post is added to the blog. "Like" the RR page? (at the top, just under the banner). Also, if you can figure out what it takes to be added as a "Member" (see right hand column) of this blog, please join us here, too. Something distracts Bunya for a few seconds, but the girls patiently wait for more. If anybun is getting groomed, they all seem to have this relaxed patience to wait for more. They want to make sure they are getting all the licks the mate is willing to give. Even more sadly, this is not the first loss for the Rabbits' Guy and family this year. 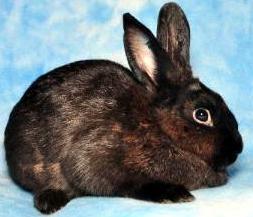 Goldie and the other bunnies are fortunate to have such a loving and caring bunny household in which to live. 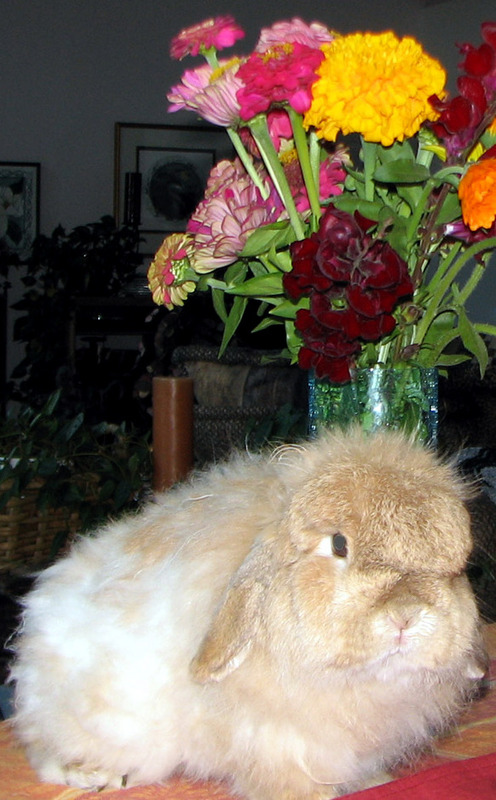 You can read about Goldie, and offer your condolences at A Houseful of Rabbits. Please make a donation to a bunny shelter near you in Goldie's memory. Rainbow Bridge is posted here. Bunny lovers know that part of bunny-proofing your home is providing them with alternative things for them to explore, chew and dig. The paper box is for that digging urge. Whatever your objective, bunnies will multitask and one item may serve multiple purposes. The digging box is fine until they have chewed it to cardboard dust and then it needs to be replaced. The primary purpose of this box was for exploration and shelter. The bunnies are going to chew on any box, but for this one, it seemed to transition from primarily a place to explore or hide into a chew toy. In this video, Ethel is giving it "what for". She wants a door where she wants a door. So that's Ethel's efforts but all of them have participated. One night, one bunny was on one end of the box and the other two on the other end. Their chewing was pushing the box back and forth like a dinghy in rough seas. Ethel was by the gate to their pen. The video was on because maybe she was going to do one of her adorable full-body flops. But no - it wasn't meant to be. Instead, she settled herself into the "chicken" position. Looks like she could lay some eggs. This was cut from several minutes, waiting for her to flop, to about 10 seconds, the time when she finally decided she'd nest herself. What I think is really funny is in the first few seconds: Ethel drops her head and tries to pull it back up, kind of an "I can't keep my eyes open or head up any longer, I'm so sleepy" micro-nap. She really fell asleep on her feet. I'm empathetic - I remember those nod-offs from some not-my-major college classes. 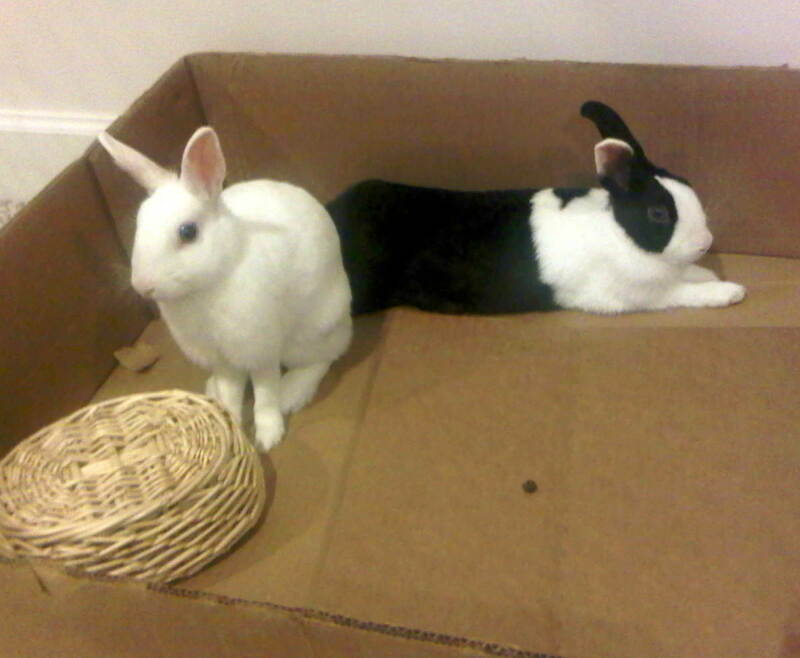 The evolution of the bunnies' paper box has been discussed (for example, here). My wife ordered something. It came in a box that was at least 8 times the size of the item, surrounded by lots of those static cling packing peanuts (hate those). Didn't matter - it was broken. The company's customer service was superb; they re-shipped the item post haste. It came in another over-size box but was packed well enough not to break. Just wish the company would be a little more "green". It would seem they could save a fortune on packing materials and shipping. Anyway, for our order at least, we tried to make them green. New boxes for the bunnies! And the rolls of brown paper that were crushed into the box as packing - another whole adventure for the bunny SCUBA box (Self Contained Underpaper Bunny Apparatus). I crumpled the paper into their paper box and, after they came out of hiding - after all, it was just the silly human - they started exploring it while I worked on the boxes. what happened to her paper box. putting a strong fence between him and the intruder. to examine this for himself. to detect the flavor nuances. It meets with all the bunnies approval. All three of them love the added paper, whether they are nibbling it, hiding in it, or just making the noisy crinkling sounds themselves ... such power - they didn't know they could make that loud a ruckus all by themselves. When we are gone and they are in their pen, they even stick their heads through the fence to grab big pieces and pull it back through to play with. More about what the boxes turned into later. Came across this YouTube video; it explains some rabbit attributes and behaviors. 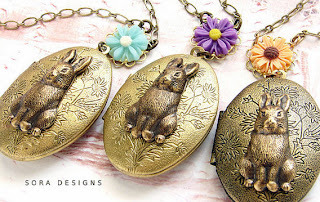 If you watch the whole thing (about 10 minutes), you can get CLE credits (no ... sorry, attorneys, not Continuing Legal Education credits - this is a bunny blog; you get Continuing Lagomorph Education credits). Whether you are a Rebunnican or Rabbicrat, vote! And whoever is elected, at least the ads will stop. For a couple of years, anyway. Okay and together, remember to keep those ears in the "rabbit ears V". But Ethel, please face forward. My sister went to visit our cousin's new home and ended up on a bunny scavenger hunt. The ceramic bunny was an art project of our cousin's daughter. Let's assume the Peter Rabbit dishes were hers, too. A couple of decades ago. A recent post talked about how Emma Thompson is reviving the Peter Rabbit stories. Ethel wants to clock us!